In Tommy Hopkins' first season as a starter he was arguably the most consistently effective offensive lineman during UConn's march to a bowl game. Naturally, expectations were high coming in the 2016 season but Hopkins never really had a chance to build on his solid 2015 campaign. However, Hopkins was injured while helping clear the path for former teammate Ron Johnson for a 21-yard touchdown run in the 2016 season opener. Hopkins missed the next four games. After averaging less than 105 rushing yards per game during his absence, The Huskies ran for 188 yards and had 412 yards of total offense in his first game back as the Huskies picked up their lone conference win in 2016 by beating Cincinnati 20-9. In the next game UConn had a season high 306 passing yards but Hopkins suffered a season-ending injury in the loss to South Florida. Hopkins was held out of spring drills as well but now he is healthy and eager to get the work as preseason camp got underway today. "It was really tough," Hopkins said. "It was disappointing going back out there and having it happen again, it was like there was no way this could happen to me. The athletic trainers did a great job on the rehab but it was disappointing. I still tried to help out as much as I could watching film. If I see something, I see a good play I will let them know." With a new coaching staff in place, Hopkins knows nothing is set in stone. These next couple of weeks will be a key time for him to prove he belongs in the starting lineup. "I am focused on camp right now, going out there," said Hopkins, who ironically was cleared to practice shortly after spring practice came to an end. "I think we have a pretty exciting group, I think we will be pretty good and I am excited to see and excited to work in camp, see it all come together." Senior linebacker Junior Joseph started rattling off names of under the radar defensive players ready to make an impact and it didn't take long for him to mention true freshman defensive Omar Fortt. Fortt, a former star at St. Luke's, enrolled at UConn for the spring semester allowing him to partake in spring drills. He took advantage of that time and saw time with the first team defense. "I was coming out, being physically, take no prisoners and with everybody nurturing me, it gave me confidence with everybody around me telling me how well I was playing," Fortt said. "Summer ball, I am going to try to ball out as much as I can. I have a great guy in front of me in Tre Bell and I'm following him." Senior cornerback Jamar Summers was also a mid-year enrollee who got on the field right away. He said he won't be surprised if Fortt does the same thing this season. "That is my guy, Omar he came in mid year like I did and he definitely accepted the challenge," Summers said. "It is a transition from high school to college, he handled it well and he has been excelling. I am looking forward to see him during training camp compete and I'm willing coach him in whatever he needs help with. He is like me, competitive, goofy at times but he is willing to put the work in. "The hard part about it is the academic side, from scheduling from the classes to doing the work, time management is a big thing in college but athletically, it is probably the best position you can put yourself in coming in mid year and getting a head start on everything as a freshman and seeing what needs to be done and how to handle things of that nature. It worked to his benefit, he is a step ahead of the freshman class that (just) came in." Fortt had three tackles including a tackle for loss in the spring game and now he is looking to use his experience during spring practice to carve out a role on the 2017 UConn team. Alec Bloom was far away from San Francisco when he saw a report in early May that he was among undrafted players trying out for the San Francisco 49ers. "I was about to take a final and I said this is definitely not true since I was sitting in class," Bloom said with a laugh. "I got a call and said I will take care of it when I get out because I am not out there." It would not be a surprise to see Bloom in training camp in 2018 in fact it would be more surprising if that is not the case. UConn's new offensive coordinator Rhett Lashlee came in from Auburn and in the last two seasons tight ends caught a grand total of two passes compared to 76 catches out of tight ends or players from other positions lining up at tight end. 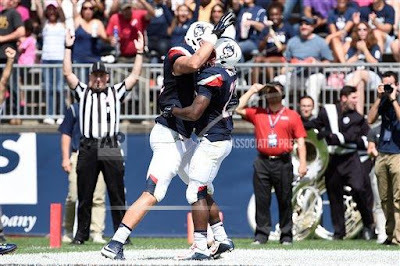 Bloom said it will be up to him, fellow rising seniors Tommy Myers and the other tight ends to earn their role in the new look UConn offense. "We get out of it as much as we put into it," Bloom said. "If we show them in practice we are an asset to the offense, we are going to get more chances. Football is like life, if you put out more, you are going to get more chances and we are ready to show what we've got." My main story off media day was focused on the fact that quarterback David Pindell and linebacker Santana Sterling's final game as junior college players happened to be against each other. As is rather typical, I wrote way too long on the story so I wasn't able to fit all of UConn coach Randy Edsall's thoughts on the two of them into the piece. Here are some quotes I thought people would enjoy reading. "He (Pindell) has this quality about him where he is very cool under pressure," Edsall said. "Watching him on film and observing some things, I don't know if I've ever see a guy get the ball out of his hands so quickly. The other thing, I am jealous of him because I think he is 3.5 percent body fat but he is a good kid who has good talent. I go out watch and observe a lot of times and by doing that, I think you find out a lot about a lot of things. It seems to me like people have already started to gravitate towards him, Santana is a guy who I thought had a knack for making plays and being around the ball quite a bit. "They are good quality kids. They don't say a lot, they just work and those is my kind of guys." Edsall said the first five practices will be about getting all the players a chance to showcase what they can do. The first scrimmage of preseason camp will be on Thursday and after that he is hoping to have an idea of who should be playing with the first and second teams. Don't look for a depth chart to be posted probably until the Sunday before the Aug. 31 season opener although Edsall is hopeful that his coaches have a pretty good idea of the first and second units well before that. Finally, I caught up with running backs Arkeel Newsome and Jason Thompson so look for a story on them in tomorrow's paper.